Is this spice blend part of authentic Indian cuisine? Perhaps you have a jar of curry powder on your spice rack—that yellow spice mix that you're not sure how to use. Maybe you figure you'll try it the next time you adventure into cooking Indian food—but you would actually be mistaken! Curry powder is not an ingredient used in Indian cooking and doesn't even represent any spice mixture typically found in a Southeast Asian kitchen. So, what is curry powder, then? Curry powder is actually a British invention, somewhat resembling garam masala, the spice mixture prevalent in North India. It was created to evoke the essence of Indian food, but in fact, is not used by any authentic Indian cook. (Curry powder is therefore not used to make an Indian curry, which is a type of dish made up of meat and/or vegetables in a sauce—or gravy—typically served over rice.) Instead, curry powder is an ingredient Westerners use to make what they think is true Indian cuisine. You would think that there would be a set formula for curry powder, as it was created to represent an ethnic taste, but there is no standard recipe. However, the main components remain the same and are usually cumin, coriander, and turmeric (which gives it its signature color). Other common ingredients include red or black pepper, mustard, ginger, clove, cardamom, bay leaf, and fenugreek. Commercial blends are often available in mild or hot (also known as “madras”). Note that curry powder doesn't include curry leaf. Curry powder has a unique flavor due to the combination of both savory and sweet spices. Savory spices like cumin, turmeric, and bay leaf give the curry a deep, earthy flavor while sweet spices, like cinnamon and clove, add brightness and pep. The level of heat is determined by the type and amount of pepper used. Milder curry powders may include black pepper or ginger while hot curry powders usually contain red chilies or other hot peppers. 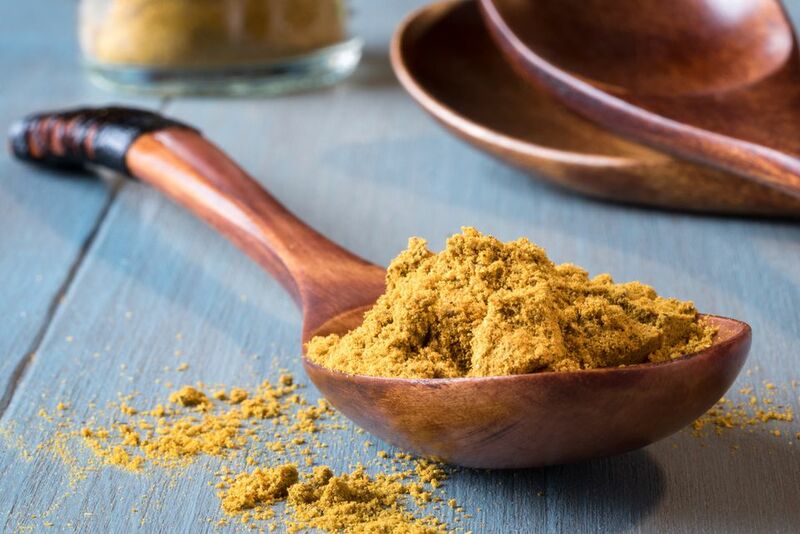 Now that you know you won't be crafting traditional Indian dishes, you can use curry powder as an all-purpose seasoning. It is commonly used to flavor soups, stews, sauces, marinades, meat, and vegetables. As the popularity of curry flavor increases, creative chefs are finding more unconventional uses for the seasoning such as hamburgers, scrambled eggs, and potato salad. If you want to put that jar to use, try curry-flavored deviled eggs! Because of its vibrant taste, curry powder can even be used as a salt-free table seasoning. In authentic Indian cuisine, whole spices are combined and ground just prior to use in order to retain freshness and potency. So it's safe to say that the pre-ground curry powder blends' flavor will not be as vibrant. Most grocery stores in the United States stock basic curry powders but they can be pricey and less than fresh. For a better value and increased freshness, look for curry powder in ethnic markets. You can also make your own curry powder using whole spices and a clean coffee grinder. What Is in Evaporated Milk?